Home Showbiz Bollywood Salman Khan tries to help Karan Johar & ‘ADHM’? 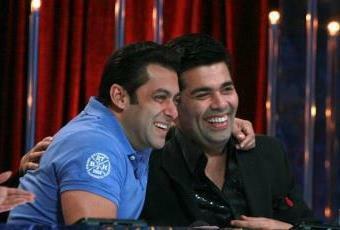 Salman Khan tries to help Karan Johar & ‘ADHM’? As per the latest rumours in Bollywood,��Salman��Khan has stepped up in support of ‘Ae Dil Hai Mushkil’ as the film faces a risk of not releasing in Mumbai, India. ��Recently, a political party in India, headed by Raj Thackeray, had threatened that they will not let the film ��release unless Pakistani actor Fawad Khan’s role was cut. Salman apparently called Thackeray this morning, to try and convince him to let the film release. It can be noted that Salman shared an extremely fond relationship with the late Yash Johar, who founded Dharma Productions. Incidentally, this news comes after��recent rumours that Salman Khan would not invite the cast��of ‘Ae Dil Hai Mushkil’ on his popular reality show, ‘Bigg Boss 10’. ��While Khan may not share the fondest history��with either Ranbir Kapoor or Aishwarya Rai Bachchan, who feature in the film, he has often supported the film fraternity and especially Karan Johar. ‘Ae Dil Hai Mushkil’ is slated to release this Diwali.��It is yet to be seen whether Khan’s conversation with Thackeray was successful. Next articleJacqueline Fernandez turns yoga trainer for family?